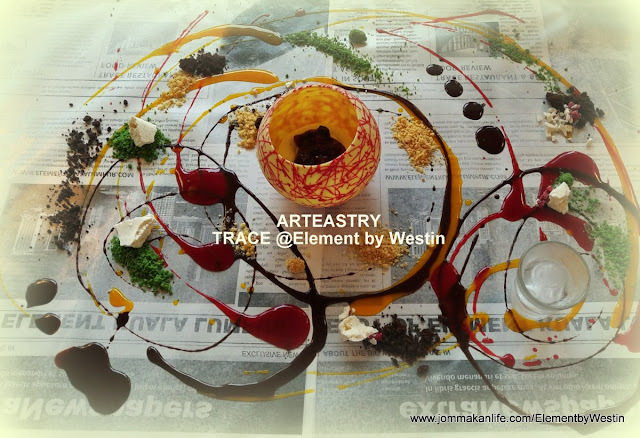 Like the name implies, ARTEASTRY stands for Art, Tea and Pastry. This creative take on afternoon tea has taken KL by storm thanks to Element Kuala Lumpur, one of the city’s newest hotels. 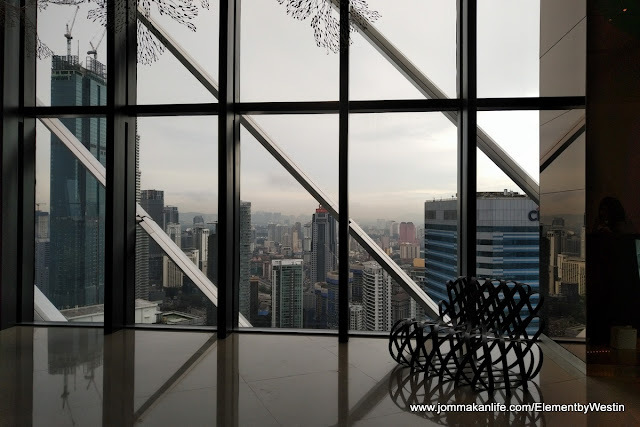 Available TRACE restaurant & bar every weekend (Saturday & Sunday) from 1.00pm to 5.00pm, you’d find breathtaking views of the city to tease your senses once you arrive at level 40 of the tallest eco-friendly Hotel in KL. The modern and minimalist all-day dining restaurant is the perfect backdrop for the ARTEASTRY experience, a convivial weekend gathering to be enjoyed with family and friends. Once you have selected your choice of fine tea (from four varieties available), a contemporary bento box accentuated with synthetic turf and elongated slate trays bearing dainty savoury morsels will be brought to your table. The tempting array included Waffle with Salmon and Crème Fraiche, Apple & Duck in Savoury Cones, Chicken Sliders in Mini Croissants with Tomato Relish, Tomato and Basil Macarons, Confit Portobello Mushroom & Swiss Cheese Bruschetta. 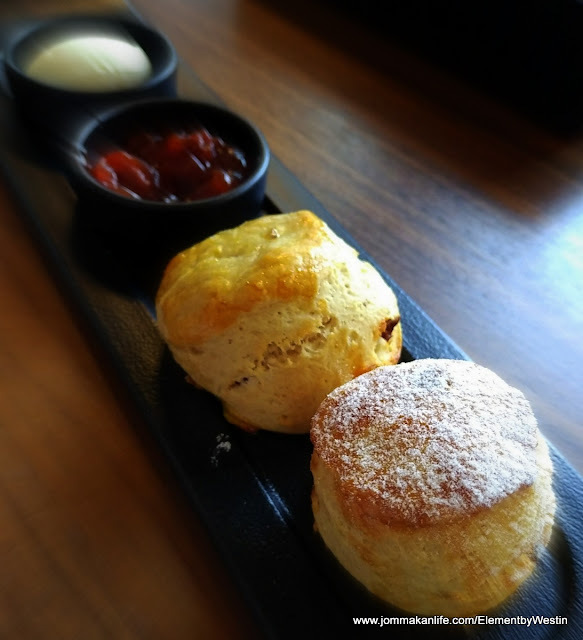 Also in the line-up were light and fluffy Scones, Earl Grey infused and Raisin studded, accompanied by Clotted Cream and Strawberry Jam. We found most of the delicious items on-point except for the savoury macarons. I’m all for such inventiveness but the macarons had sadly softened by the time we got around to devouring them. Luckily the minor hiccup was soon forgotten when the chefs trotted out their artistic dessert presentation. It was rather theatrical but fun-filled and made quite a splash with everyone. Billed as “The Red Splash”, a white chocolate sphere of Framboise a la Mascarpone is placed onto a large sheet of waxed food-grade paper (printed to mimic newsprint). 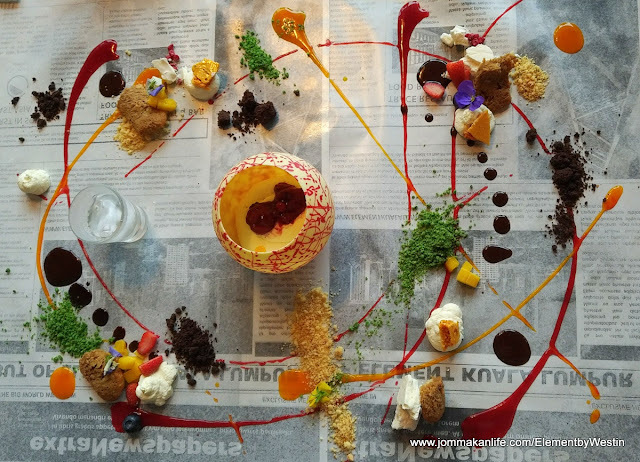 Then the chefs unleashed their creative streaks loose; splashing, dotting and painting an edible work of art on the table with freestyle droplets and strokes of Raspberry Confit, Mango Purée and melted Chocolate. 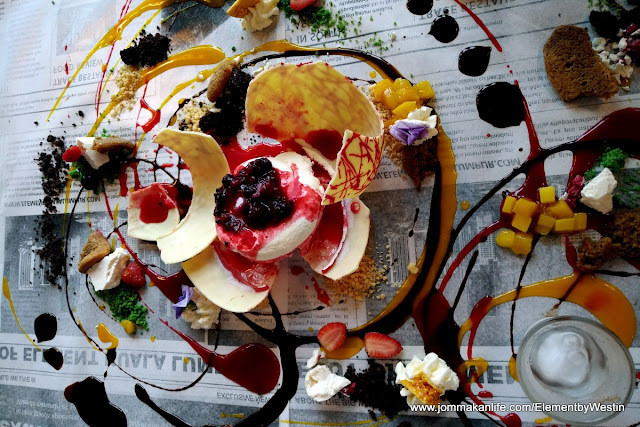 Clusters of Meringue Shards along with Vanilla, Chocolate and Chlorophyll Soil, Sponge Fingers, Mascarpone, Fresh Berries, Edible Flowers and Mango Chutney were used to decorate the creative swirls and streaks. 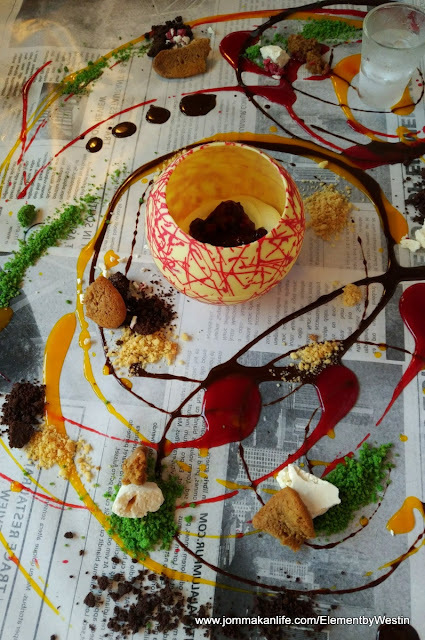 For the finale, we were invited to pick up the white chocolate sphere and drop it in the middle of the art piece and create a delectable mess in the centre. The overall effect might appear terribly chaotic but surprisingly, the various combinations of flavours and ingredients worked well together once we spooned up the different items to sample. Priced at RM78 nett per set for 2 persons, the ARTEASTRY afternoon tea is highly recommended as a unique and great value experience. Reservations are advisable since its popularity has spread by word of mouth and gone viral in social media. For reservations, please call TRACE, tel: 03-2771 3351. 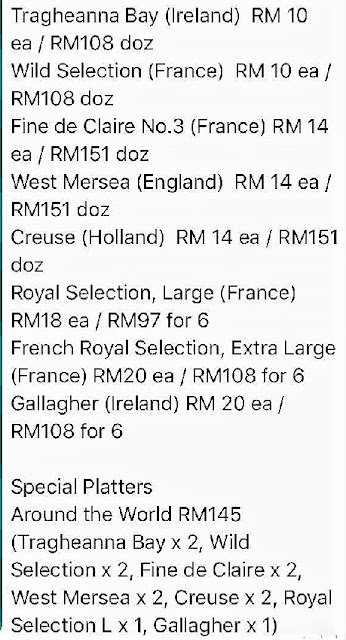 Address: Level 40, Element by Westin Hotel, Jalan Binjai, Kuala Lumpur. Sangria is always a good idea. Especially after battling rush hour traffic. Two carafes of the boozy drink boosted our spirits as we sat down to a much anticipated dinner at Bait. Sibling outlet to the one in Bangsar, this new outpost is already reeling diners in...the place was humming with a palpable sense of conviviality the weeknight of our visit. Executive Chef Logan Terence Lopez promised us a feast and proceeded to exceed his side of the bargain. Living up to Bait’s core focus that is fresh seafood, Chef Logan opened his showcase with a sumptuous selection of imported Oysters from Ireland and France. Freshly shucked and served on half shells, the molluscs were meaty and slippery succulent, teasing our palate with delicate nuances of the sea. We savoured some au naturel and slurped others up with a dash of freshly squeezed lemon juice. Hot on their heels came a succession of tapas-style Small Plates that would please Captain Jack Sparrow. Our dining party were hard pressed to choose our faves but we fell hook, line and sinker for the dark-as-night Cuttlefish (RM30 nett) braised in squid ink gravy with pan-fried polenta. The textural contrasts of this unique ensemble raised them a cut above the rest. Stuffed with paella & cheese, the bright, robust flavours and myriad of textures of Baby Squid (RM28 nett) in paprika sauce conjured up cheery images of sunny Spain. Eggplant Maghmour (RM16 nett) - Lebanese moussaka enlivened with smoked tomato ragout and mashed chickpea proffered complicit appeal with Garlic Melba Toast (RM10 nett). Smeared with garlic cream, grated nutmeg and chilli flakes, the crunchy slices hit the spot for us. Another feeding frenzy followed when servings of Soft Cheese Bruschetta (RM15 nett) with cherry tomato coulis, mozzarella & basil, Patatas Brava (RM22 nett) with spicy tomato pesto and sautéed beef chorizo and Prawn Mango Salad (RM26 nett) featuring watercress, grilled prawns, Indian mango & honey mustard dressing appeared at our table. Miraculously, we managed to put away the delicious Stuffed Lamb (RM30 nett) in roasted sweet peppers, blue cheese sauce and balsamic glaze too. Who could withstand such irresistible accents of smoky sweetness, rich savouriness and muted tanginess in one go? For me, the prized catch at Bait has to be the Baked Sole (RM79 nett). The flatfish's natural sea-sweetness proved good quality ingredients rarely need superfluous "dressing" but anointed with garlic, chilli & Spanish parsley, it was sublime. The supporting cast of cherrystone clams floated our boat further. Despite my valiant attempt, I couldn't take to the sourish Wild Mushroom Soup (RM25). My palate just refused to accept the unwelcome presence of carrot, celery & tomato in the earthy broth topped with cheese espuma. Gastronomic salvation appeared in the form of Fettucini Squid Ink (RM62 nett) with baby squid ragout, smoked pepper and bottarga. Never mind the ebony-black mess - the pasta tasted so lush and silky, we lapped everything up instantly. After such highs, the Grilled Perch Souvlaki (RM48 nett) with roasted pepper, tomato gravy and coriander dip was underwhelming. It was artistically presented and deserved a chance to be sampled under normal circumstances. For the office crowd, Bait dangles great value lunch deals to draw them through the door. 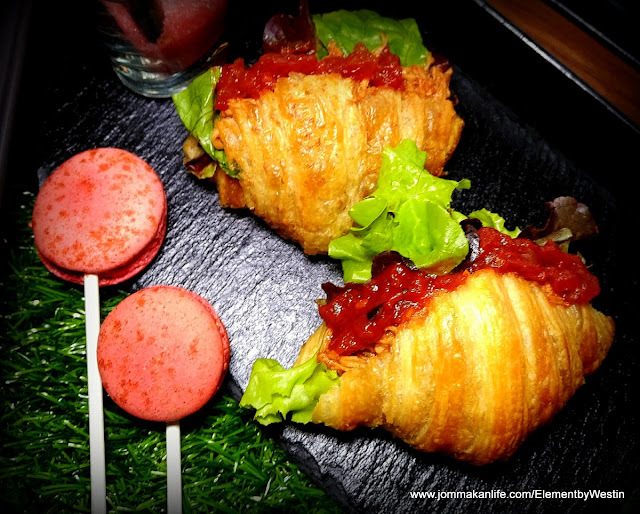 Starting from RM29 nett, options include Perch Fillet Fish & Chips to the moreish Set Lunch of Jumbo Prawn Curry Laksa (RM49 nett) consisting of gluten-free rice noodles, spiced Nyonya curry and fresh vegetables or Wagyu Beef Steak (120g) Sandwich with melted raclette cheese, sautéed mushroom and dill pickles. The set lunch includes appetiser or soup of the day and coffee/tea/soft drink.